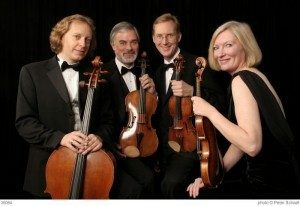 The Westchester Chamber Music Society is pleased to present the American String Quartet. It is our final concert for the season and we have been lucky, yet again, to be able to bring this fine group of musicians to our Westchester/Fairfield community. This performance, as with all of our concerts will be appreciated in an intimate venue, one in which chamber music was intended to be heard. Currently in its 45th season, the American String Quartet is internationally recognized as one of the world’s finest ensembles and has spent decades honing the luxurious sound for which it is famous. The American is well known for its exceptional recordings of quartets by European masters and American composers. The quartet’s recordings of the complete Mozart string quartets on a matched set of Stradivarius instruments are widely held to set the standard for this repertoire. Critics and col­leagues hold the American in high esteem and many of today’s leading artists and composers seek out the Quartet for collaborations. Formed in 1974 when its original members were students at The Juilliard School, the American String Quartet was launched by winning both the Coleman Competition and the Naumburg Chamber Music Award in the same year. Since that time, the American has continued to delight audiences across the globe with their outstanding performances. Please join us for this final concert of the 2018-2019 season. Meet the musicians and enjoy refreshments at the post-concert reception.